After being handed two successive defeats by Barcelona in Copa del Rey and La Liga, Real Madrid were hoping to put everything behind. The Spanish side came into their UEFA Champions League second-tie optimistically as a berth in the quarterfinals looked almost sealed. Real Madrid played at home in the second-leg with a two away goals advantage having scored twice at the Johan Cruijff ArenA in the first leg. 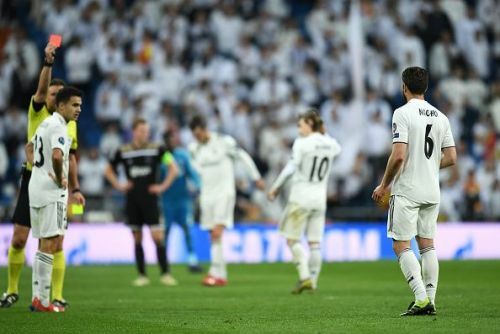 Ajax had their work cut out for them as they had to overturn this tie at the home of champions, Santiago Bernabeu. Ajax started the game in a fashion similar to what we saw in the first leg and the only differentiating factor here was, this time they had goals to show for it. An error from Toni Kroos early on in the game allowed the Dutch side to open the scoring as Tadic beautifully set up Ziyech. The youngsters did not allow the Champions to grow into the game and punished them with a second, doubling their lead. Real Madrid switched off for a moment and Ajax took no time capitalizing as Neres brilliantly capped off the move. To add to the misery both Madrid wingers Vazquez and Vinicius Jr had to leave the pitch before the end of the first half due to injuries. Real came out roaring in the second half only to see Tadic score a highly controversial goal. With an aggregate score of 2-4, the tie looked done and dusted but Asensio struck one past Onana giving Madrid some hope. That glimmer of hope was short lived as Lasse Schöne scored a stunning free-kick past Courtois to cap off the final score 1-4 (3-5 on aggregate). This was the scoreline no one could have predicted before the game but things could have been worse. This defeat puts Solari's squad selection and tactics under the scrutiny. Solari, to everyone's surprise left Isco out of the squad. Isco could have brought stability and balance in this midfield which was much needed in this game. Even Marcelo was benched and was an unused sub for the game. Meanwhile, Real Madrid's defensive structure without Sergio Ramos was abysmal. They were caught out of position, left clear gaps to be exploited and were caught off guard on counters various times. It looked like Solari had no plans once Ramos is unavailable for a game. The manager failed to oraganize the defence and could not respond to the adversaries. Senior players such as Toni Kroos and Casemiro struggled to keep up with the pacy youngsters like Frenkie de Jong ran the show in the midfield. One problem that has been evident throughout the season is the clinical prowess. Bale and Benzema were ineffective in front of the goal as they found it hard to put the ball in the back of the net. One thing for sure Madrid missed Ronaldo badly. Solari's days at the club seem to be numbered and it would be astonishing to see if he can survive till the end of the season . Real Madrid and Solari were humbled by the young Dutch side. It has been historic to see the current trophy winners crash out in the Round of 16. Real Madrid's problems lie deep above the managerial level and need immediate attention.